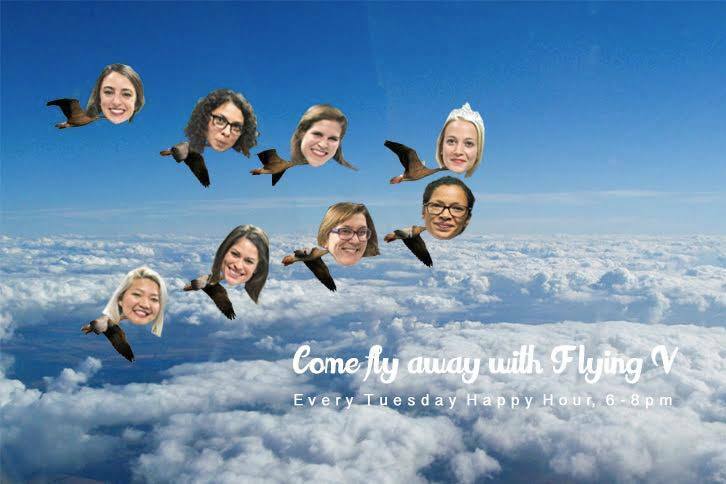 Flying V is an 8-lady-strong New York City-based improv team that has performed in theaters across New York City. With combined training from the Peoples Improv Theater, The Annoyance (NYC), Upright Citizens Brigade, and the Magnet, their style possesses a flavor as unique and diverse as the city itself. This all-lady powerhouse shares more than just a synced menstrual cycle–their long-form improv style is fast -and -furious, with scenes that are often as goofy as they are grounded. The secret to the sauce? They are always having an insane amount of fun. QUACK QUACK QUACK. Actress, improviser and sketch comedian. Lover of donuts, yoga and puns. Alyssa is a performer with PIT house team The Duke, the improv team Flying V and with the sketch team Nerds on Fire.